Jane Sager wakes up every morning to the colors of the day, with the moon reflecting over the ocean as the sun begins to rise. In those serene moments, she’s grateful to be living her dream. “When I’m running on the beach in the early morning here in Manhattan, the views are a true work of art,” Jane says. Savoring every moment of her casual beach lifestyle, Jane is always eager and willing to share it with everyone she meets. Raised in Kansas, she took her Midwest work ethic and moved to Southern California to pursue her career. She was among a very select group of highly talented electrical engineers in the country at the time, which inspired Hughes Aircraft to recruit Jane. “It was a very exciting time in my life. Every day I would wake up early and get to work when it was still dark, with so much to do and learn with no limitations,” she says. Later, she led a cutting edge team of top-caliber engineers in the design and development of several advanced tactical radar systems. Attentive to every detail throughout the sales process, Jane brings a creative approach to finding just the right solutions to real estate challenges. She thrives on sharing her coastal lifestyle with others and provides in-depth market knowledge to help you make informed decisions. Whether you are buying your dream home on the waterfront or looking to sell your current property, she puts your needs first, doing all that it takes to make your real estate experience as smooth and successful as possible. For Jane, real estate success truly is an art form. 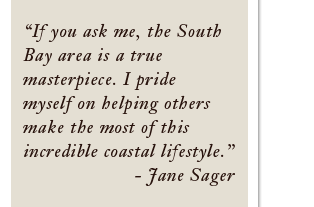 If you are buying or selling real estate in the South Bay area, call Jane Sager today and discover the difference her energy, expertise and creative approach will make for you. 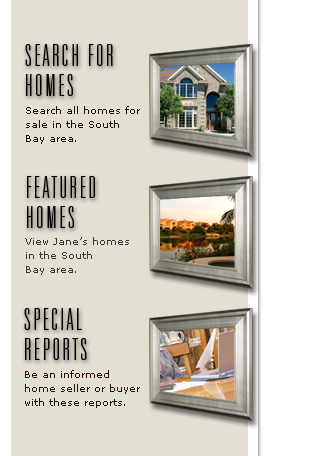 Jane proudly serves the real estate needs of residents of the South Bay area.